Most people go home disappointed. Last Thursday, a new exhibition on Vikings opened at the Canadian Museum of History. 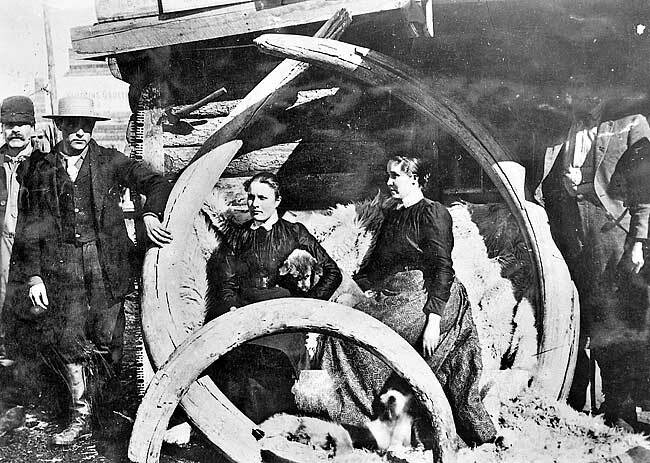 On a ten month international tour, aside from showing off over 500 artifacts rarely seen outside Sweden, those behind the traveling exhibition hope to change some of the stereotypes modern audiences have about viking culture. 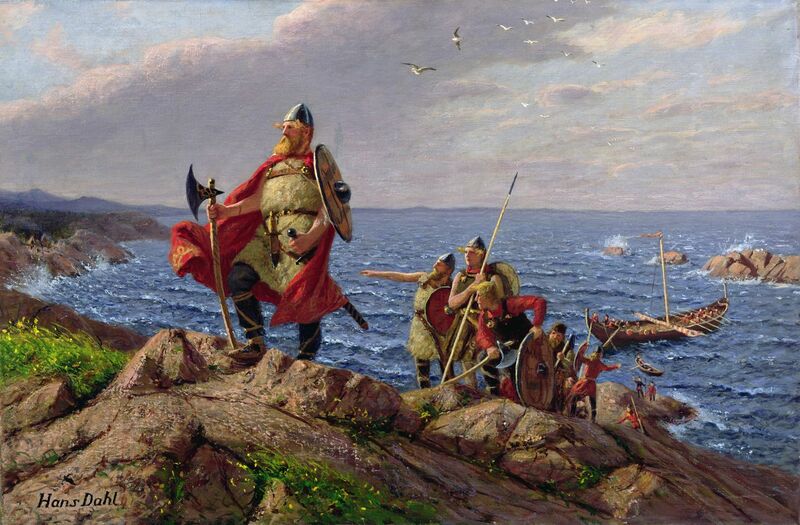 However, the perception that Vikings were sea-faring explorers is definitely true and that brings us to their connection to Canada. I’m thankful for Google Image Search. You never disappoint me. To those who are celebrating this long weekend, Happy Thanksgiving! 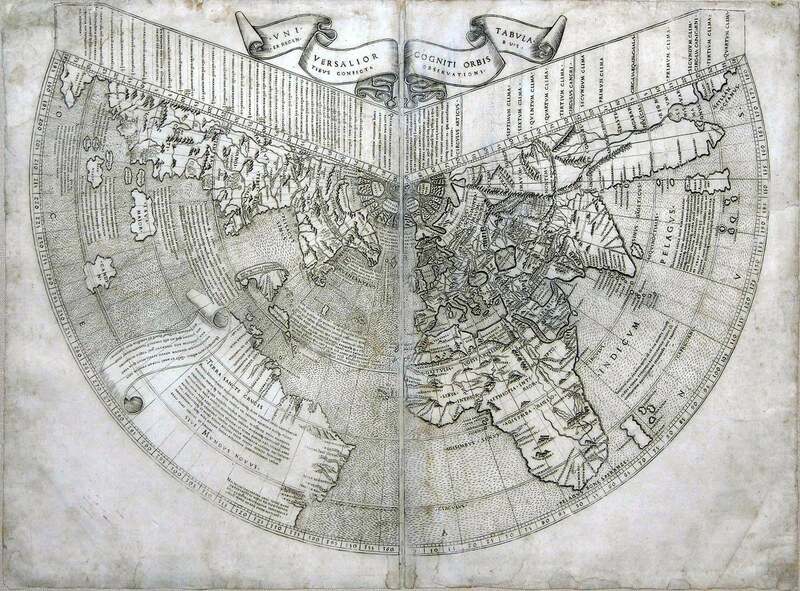 Johannes Ruysch’s Map of the World (1508). I debated whether or not to include this map, as it predates the Paolo Forlani map. However, I thought I should show what is seen as one of the earliest, if not the earliest depiction of Canada on a map. Sort of. If you click the image, zoom in, and look at the middle, you will see the word Grvenlant (Greenland). The little piece of land to the immediate left called Terra Nova is Newfoundland. We know the image is meant to be Newfoundland and not just the “New World” as its name implicates because the words, Insula Baccalauras (Island of Codfish) appear along the coastline. That’s where Baccalieu Island gets its name from. Ruysch blended Ptolemy’s map of the world with information from the discoveries made by John Cabot, Christopher Columbus, and Marco Polo. Given that the extent of the New World had yet to be realized, Newfoundland is connected to Asia and the rest of North America is missing. Amongst researchers, there appears to be some controversy over whether Grvenlant actually refers to Greenland as we know it, or if it is Labrador. Directly below Newfoundland is Spaginola or Hispaniola (today’s Dominican Republic and Haiti), and then upper portion of South America appears just below that. Cuba is missing. Japan is also missing. Sort of. This is my favorite part of the map. Apparently when Ruysch compared the Polo’s account of Zipangu (Japan) and Columbus’s account of Hispanola, he came to the conclusion that they were the same place. Thomas Suárez, Shedding the Veil: Mapping the European Discovery of America and the World, World Scientific Publishing (1994). 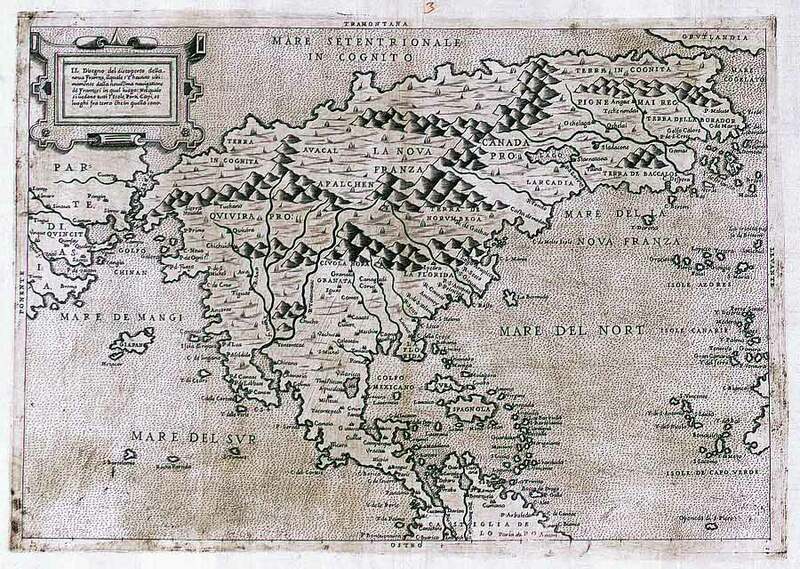 Paolo Forlani was an cartographer from Venice and thus the map is in Italian. If you look closely you can see some of the names of Canada Pro. (Proper) including La Nova Franza (New France), Terra De Laborador (Labrador), Larcadia (would become Acadia), Stadacone (the future site of Quebec City), and Ochelaga (the future site of Montreal). This map also includes the Apalchen (Appalachian) Mountains. Stadacone or Stadacona was a 16th century Iroquoian village located near present-day Quebec City. Ochelaga or Hochelaga was also a Iroquoian village, however this one was located on Mont Royal in present-day Montreal. These village names were made known to European mapmakers as a result of Jacques Cartier visits to them. Among other firsts on the map is the Anian Strait between North America and Asia. Meant to represent the Bering Strait, this is an early map that correctly does not connect the two continents. With this is in mind, what I find the most curious is that just a year prior, Forlani published a world map that has some major differences. In his world map, Forlani has Canada and Asia smashed together to form a super continent. No voyages set sail up there at the time to confirm or dispute this, so I wonder what made him change his mind a year later? 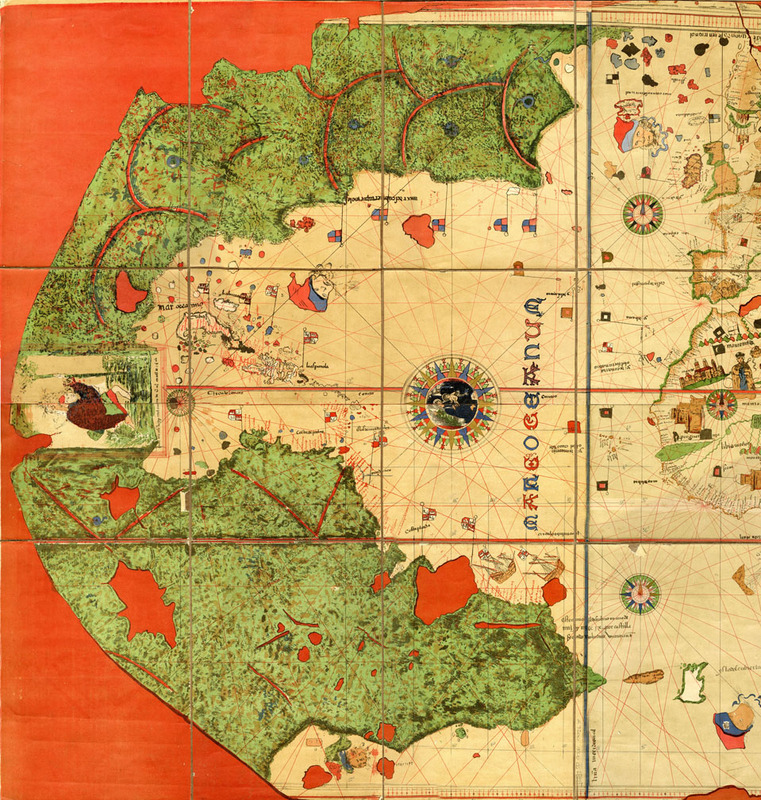 Above is the earliest European cartographic work to depict the Americas. (Okay, so, it doesn’t really show Canada, per say, but if you are going to start somewhere you might as well start at the very beginning!) This is only part of the map, click here to see the rest of it. As opposed to the highly visual Europe and Africa imagery, North and South America are mostly green and sparse on this map. St. Christopher, the patron saint of travel (and possibly a reference to de la Cosa’s fellow explorer, Christopher Columbus), separates the two continents and the Caribbean is right in the middle of the two. North America is marked with blue and red flags and the title, “discovered by the English.” De la Cosa himself explored the Caribbean and the northern parts of South America. Meanwhile, the North American coastline is vastly inaccurate because it was based off of details of John Cabot’s voyages to Newfoundland, which de la Cosa was not a part of. Unfortunately, if Cabot or his sailors made their own maps of their voyages, none are known to have survived. De la Cosa was a Spanish navigator and cartographer as well as the owner and captain of the Santa María—the famed ship Christopher Columbus ~discovered America~ with. He joined Columbus on his first three voyages to the New World and did his own exploring of South America (particularly Colombia and Panama) afterwards. While in Turbaco, Colombia, de la Cosa was shot and killed with poisoned arrows from locals who were angry at the Spanish’s intrusion into their village. The men who survived the attack came back later on and murdered every single inhabitant of Turbaco to avenge his death.